The following movie review is from someone who never read "IT," never saw the TV miniseries "IT," and didn't know anything about "IT," except that there was some sort of clown in "IT." 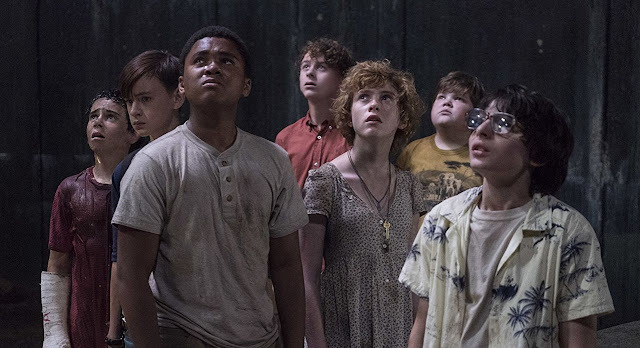 In IT, director Andy Muschietti's well-made and effective Jump Scare-pallooza adaptation of Stephen King's seminal horror bestseller, seven children wrestle with the eternal question of youth: how do you fight a CGI clown? The clown's name, he says, is Pennywise the Dancing Clown (Bill Skarsgård) and he is a very evil clown who lives in the sewers beneath the haunted town of Derry, Maine. According to the movie's wobbly and undercooked mythology, Pennywise has been in Derry since the town was founded, killing children (and adults sometimes?) and feeding on their fear every 27 years. Then he takes a long clown nap and comes back. Why? Why anything? Let's get to the jump scares. It's the summer of 1989 and seven children from Derry are so haunted by a killer clown and others also trying to kill them, they had no time whatsoever to go to their local bijou and watch Batman and Lethal Weapon 2. Imagine, seven kids who didn't see Batman in the summer of '89! It boggles the mind. How is that even possible? Well, these kids get a pass, I guess, because they're preoccupied by different a killer clown than the one Batman fights, and other lethal concerns. These nerdy kids dub themselves the Losers Club, and they are, by order of being memorable, Billy (Jaeden Lieberher) the stutterer and ersatz leader who lost his baby brother to the clown in the film's iconic opening sequence, Richie (Finn Wolfhard from Stranger Things) the one who swears a lot, Ben (Jeremy Ray Taylor) the fat new kid on the block, Mike (Chosen Jacobs) the token black kid who looks like a young Muhammad Ali, and the rest. Into their midst enters the best character in the whole shebang, Beverly (Sophia Lillis), who is a g-g-girl, but the kind of cool, courageous girl with a standard icky home life any boy would count themselves lucky to know. The Losers stick together, mostly, against any and all assailants, and the clown is just one of them. There are also juvenile delinquents in Derry who are so shockingly malevolent and homicidal, it's way more jarring than the sewer clown. Each child is haunted by the clown throughout IT, which leads them to come together and ultimately fight It. The Losers Club becomes a Scooby Gang, trying to uncover the secrets of the clown as best they can. Each minor revelation they reach begs more questions: it seems like the clown has been around for centuries, but seems to have no rules. The clown can manifest into all of their homes or where ever they are, in daytime or night, and attack them at will. When the Losers realize the clown lives in The Obvious Haunted House in the middle of town, they enter with no plan or weapons and barely survive. Later, when Beverly is captured by the clown but not immediately murdered for some reason, the Losers return to the Haunted House armed with whatever they have. Again, the question is how do seven tweens fight a CGI clown? Turns out hitting it enough times with whatever's handy does the trick. Still, IT is held together by some strong, endearing performances from the kids and some terrific atmosphere, making the small town of Derry nice and sinister. Every adult in Derry is some kind of repulsive creep, and the local bullies are said to be 15 or 16 but look 25 compared to the tween cast. There are obvious odes to Stand By Me and Carrie, which, along with The Shining, are on the upper tier of Stephen King adaptations. IT falls somewhere below that level but is still a 🎈🎈🎈 good time horror tome. IT sticks the landing, bonding the Losers Club with their promise to return as adults in 27 years (or 2019) for the already greenlit IT: Chapter 2. But there's just something heartwarming about seven kids, now friends forever, bonded by self-inflicted stigmata.